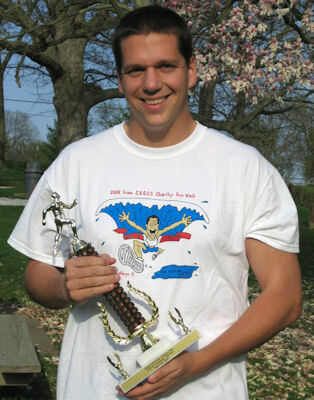 Brett Andersen, 23, of Lockport, was the overall winner of the Team C.R.O.S.S. 10K run held in La Harpe last month. He ran the 6.2 miles in 44:12 minutes. That's an average pace of 7:09 per mile. "But," he says, "I hope to make that my marathon pace" in future contests. Brett is the boyfriend of Shalyn Shirey of La Harpe. Many who know Shalyn, a great distance runner in high school and college, would agree the couple make a great match. Brett currently attends Western Illinois University where he just finished his first year as a graduate student in the school psychology program, finishing up finals this week. Aside from studying to become a school psychologist, Brett is training for the New York City Half Marathon in July, and the Quad Cities Marathon in September. His plans are to qualify for the Boston Marathon down the road along with his girlfriend, Shalyn Shirey who is now becoming a marathon runner as well. Shalyn works as a postal carrier in Monmouth, a good job for a runner. Brett decided to be a part of the local race in La Harpe because, he says, "I love running and wanted to support a great cause. I was very happy to see Team C.R.O.S.S. raise over $4,000 total for the Hurricane Katrina Relief Mission." "My goal was to have fun and not to get injured," but Shalyn, who had to work that day and couldn't participate said, she knew he would be crusin' out front. He loves it and he has been training hard. "I ran the St. Louis Marathon just three weeks prior to the La Harpe race," Brett said, so I wasn't able to train specifically for this 10k. I spent the weeks leading up to this race resting and recovering. After the Team C.R.O.S.S. 10K run of 6.2 miles, "I was tired, but happy we had such nice weather although it was a little windy." Brett enjoyed meeting other runners. "Richard Link was the 2nd person to finish the 10k (his time was 45:17) and he is from Oquawka. I talked with Richard prior to, and after the race, and he told me that he typically runs half marathons including the Quad Cities and Springfield among others. I believe he will be doing the Great River Bridge 6 mile race in Burlington, IA on May 17th. Brett said how much he appreciated Team C.R.O.S.S. for putting on such a "professionally organized race. The course was very well marked with police stopping traffic. "We were treated to a water station half way through the race and water, apples, and bananas afterwards. The volunteers and spectators were all wonderful. The t-shirt and awards were very nice as well. Brett is also a great skate boarder and he played baseball at Lincoln Land Community College, and Western Illinois University.